I haven’t posted any fashion plates in a while, and it’s time to remedy that. I’ve recently found some lovely ones, including an image with a young mother and her two children. It is quite rare to come across such tender images in fashion illustrations, and I hope you will enjoy it. And the others too! A Pelisse of fawn-coloured gran de Naples, delicately embroidered in black outline down each side of the front where it closes, as far as to a very broad border of black velvet, which surrounds the skirt next the feet, nearly as high as to the knee; at the head of which is a trimming of light sable, or some other valuable light-coloured fur. The sleeves are a la Donna Maria, and they are trimmed up the outside of the arm, where the sleeve tightens at the cuff, with fur. Round the waist, which is made plain, is a black velvet zone, clasped with a gold brooch. The collar of the pelisse turns back, and is surmounted by a French, double ruff of lace. The bonnet is of black velvet, trimmed with a bow of the same, and three aigrettes of blue corn-flowers and ears of corn; the aigrette in front larger than those on each side. A Chantilly lace veil is worn with this bonnet, which ties under the chin on the right side, with a bow of black satin ribbon. A boa tippet of marten skin is added to this appropriate winter pelisse. The half-boots are of fawn-coloured kid, tipped at the toe with black. 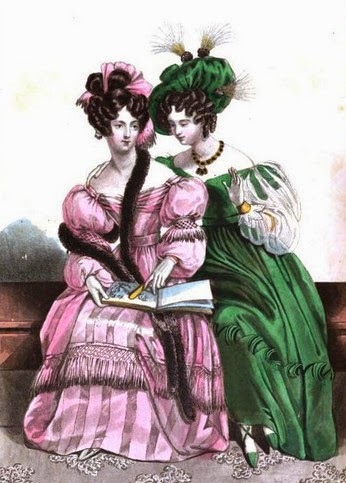 A Dress of pink satin; the border trimmed en jabots, with the same material, each one bordered by a broad, rich, white blond: these ornaments ascend from the hem next the feet, as high as to the knee. The corsage is made quite plain, with a very broad falling tucker of blond. Over short sleeves of pink satin fall long ones of blond, entirely a rimbe’eile, without any confinement. A dress hat of pink satin forms the coiffeure: this is turned up in front, and lightly ornamented with small white ostrich feathers. A superb veil of white blond falls carelessly over each side, and at the back of the hat. The jewellery ornaments worn with this dress are either pink topazes, or Ceylon rubies, set a l’antique, in fillagree gold. The shoes are pink satin, tied en sandales. A Dress of gaze satinie, the ground rose-colour, the stripes of that peculiar shade of drab-colour which resembles unbleached cambric. The skirt, somewhat more ample than last month, is slightly gored, and trimmed rather below the knee with a fringe of uncommon breadth and beauty. It has an open-worked head, very richly wrought in lozenges. The corsage is cut very low, but not quite square round the bust, being rather higher in the shoulders than evening dresses generally are. 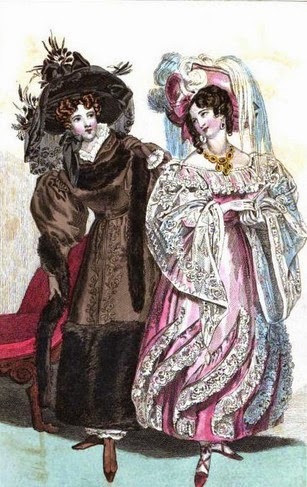 Sleeves, a la Sultane; very wide, fastened at the wrist by gold bracelets, and drawn round the arm just above the elbow, by a row of fringe, to correspond with that on the skirt, but narrower. The hair is arranged in loose full curls, which fall low on each side of the face, and parted in the middle to display the forehead and eyebrows. The hind hair is disposed in two very large knots on the crown of the head. A scarf of Circassian gauze, corresponding in colour with the ground of the dress, and fringed at the ends, is tastefully arranged in conques, which are intermixed with the bows of hair. One of the ends falls on the left side to the neck; the other forms a tuft on the right side. The necklace, earrings, and bracelets, worn with this dress, are a mixture of pink topazes and filagree gold. A boa tippet, of the finest sable, is thrown carelessly round the neck. White kid gloves. Slippers, white gros de Naples. A Gown of gros d’Orient; the colour, vert de Chine; the border of the skirt, which reaches nearly to the knee, cut in double dents, which are corded round the edge with satin. The corsage, cut exceedingly low, and falling much off the shoulder, is crossed before and behind, and disposed in two folds on each side. Short and extremely full sleeve, of the bouffant form, over which is a long and very loose one of gaze AErienne, with a cuff a la Montespan, cut in deep scollops, which turn back from the wrist. The hair is arranged in tirebouchons, which fall as low as the neck on each side of the face. Head-dress, a beret composed of green satin. This is of a very large size, and is ornamented with three esprits; two are placed near the top of the crown on the right side, and one under the brim on the left. Massive gold ear pendants and bracelets, the latter a la Grecque. Necklace, gold and emeralds, with three very large emeralds pendant from the centre. Gros des Indes slippers, en sandales. White kid gloves. 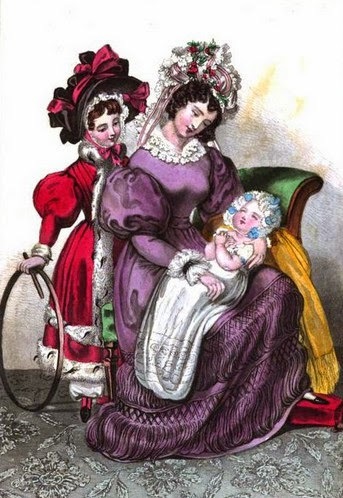 A gros de Naples dress, the colour a shade between lavender and lilac; the corsage sits close to the shape, is made quite up to the throat, and fastens behind imperceptibly. Tight long sleeve, with a very full upper sleeve, which comes nearly to the elbow. 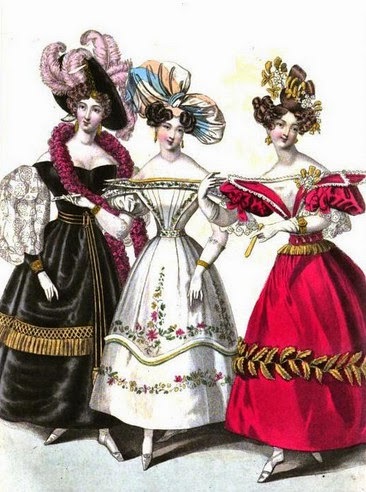 The ruffles are of embroidered muslin, and of a new form: they are composed of two rows each, set on full; one turns upwards, the other falls over the hand. A black velvet bracelet, with a gold clasp, divides the ruffle. The trimming of the skirt consists of two rows of very broad rich feather-fringe, corresponding in colour with the dress; the rows placed very near each other. The collarette is worked to correspond with the ruffles: it is of the pelerine form, but of a small size. Morning cap, a high full caul of English lace, the fulness divided by rouleaux of satin, edged with narrow lace. A bouquet of roses is placed rather to the right side, and some single flowers are interspersed among the rouleaux. The strings, which are of broad gauze ribbon, hang loose. A Pelisse of Indian-red grog de Tours. The corsage is disposed in folds, the sleeve full at the upper part of the arm, and nearly tight at the lower; it is terminated with an ermine cuff. The skirt is bordered with a broad band of ermine; a second band, something narrower, is placed at some distance above it. A black velvet bonnet, worn over a white lace cornette; the form of the bonnet is somewhat between the French capote and the English cottage bonnet. It is trimmed with an intermixture of black velvet and geranium-coloured satin nemds; the strings, and it single noeud, which ornaments the inside of the brim, are of the latter material. Morocco leather half boots; slate-coloured gloves; boa tippet of ermine. A black velvet gown, the corsage made to sit close to the shape. It is cut very low round the bust, and fastens behind imperceptibly. The back is of rather more than the usual breadth. Blond lace sleeve over one, en beret, of white satin; the sleeve, which is very wide, is terminated by a velvet cuff, finished at the upper edge by a single point . The trimming of the skirt consists of a very broad, rich gold fringe, placed immediately above the hem. The ceinture is of broad black ribbon, striped with gold; it fastens in front with a massive gold buckle. One end of the ribbon, terminated by gold fringe, descends below the trimming of the skirt. The head-dress is a black velvet hat, the crown low, and terminated in the centre with a cameo set in gold; five rows of gold chain issue from the cameo across the crown, and descend to the brim, on the inside of which is placed a double row of gold chain, terminated by a corresponding ornament. A profusion of long, flat ostrich feathers, of a bright rose-colour, are placed in different directions round the crown, and two feathers ornament the inside of the brim. A cameo, which divides the curls on the forehead, meets the gold chain that adorns the brim of the hat. Gold ear-rings and bracelets. A boa tippet, composed of dark cherry-coloured, and black curled feathers, is thrown carelessly round the neck. The slippers are of white gros de Naples, en sandales. A Dress of bright cherry-coloured gaze de St. Valiere, over a gros de Naples slip, to correspond. An under corsage, of white satin, is cut low, and square, and edged round the bust with narrow blond lace. The corsage of the dress is open before and behind to the centre of the waist. It turns back in a fold, which is very narrow at the bottom, but broad at the top of the bust. These folds are edged with blond lace: they are open on the shoulder, and form an elegant finish to the sleeve. Cherry-coloured ceinture, embroidered in gold, and terminated at the waist by a fall of gold fringe. Sleeve, a la Maintenon, terminated, en mancheite, with very broad blond lace. The trimming of the skirt consists of a wreath of foliage, embroidered in gold at the upper edge of the hem. Coiffeure, a la Donna Maria. The hair is dressed in very full curls on the temples, and in bands and bows, which are brought very high on the summit of the head. It is ornamented with gold flowers mingled with white roses. The bouquet, a la Jar dinure, placed on one side of the bosom, corresponds with that in the hair. The bracelets and ear-rings are of massive gold; the latter in the girandole form. What do you think of these dresses? Which one would you ladies have worn?